Link Party Palooza -- and HUGE Silhouette Giveaway!! Link Party Palooza — and a HUGE Silhouette Giveaway!! 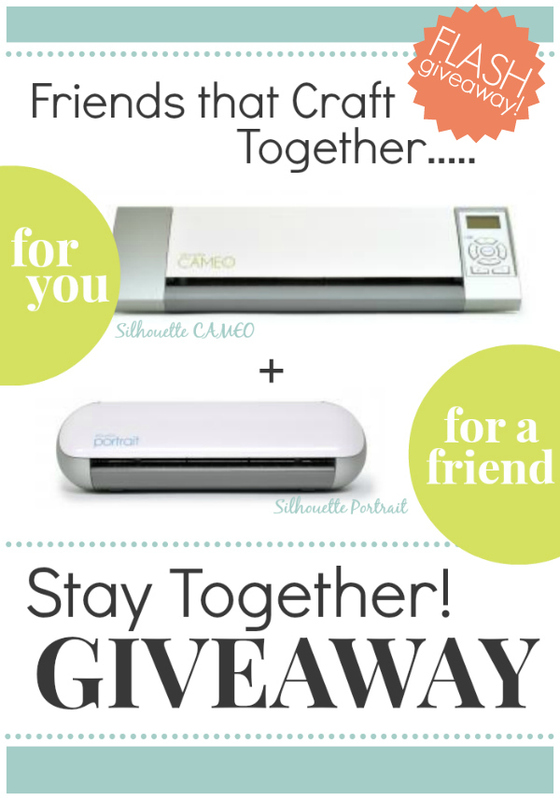 This week’s fantastic giveaway is huge – but only a few hours left: the winner gets BOTH a Silhouette Cameo and a Silhouette Portrait! This means you’ll have one to keep and one to share with a friend! I am so excited to be teaming up with some of my all-time fave bloggers to bring you this AWESOME giveaway! Please show these awesome bloggers some love! Use the giveaway widget below to enter! Remember, you only have 72 hours to enter this giveaway! And make sure to tell your friends to enter as well so you have more chances to win! Note: all participating bloggers are using the same Rafflecopter form, so you only need to enter on one blog! *This promotion is in no way sponsored, endorsed or administered by, or associated with Facebook, Pinterest, or Instagram. We hereby release them of any liability. The winner will be notified via email on January 4, 2014 and will need to respond within 48 hours to claim their prize or another winner will be chosen. The prizes will ship within 7 business days of the end of the giveaway. Giveaway starts Wednesday, January 2, 2014 at midnight pm EST and ends Friday, January 3, 2014 at midnight EST. Once the giveaway ends, winners will be chosen randomly using the Rafflecopter widget and contacted within 24 hours by email. This post will be updated with winners’ names once we’ve heard back from them. Open to continental U.S. residents only. Must be 18 years old to enter. And did you check out my 26 favorite projects of 2013? Now it’s time to link up your projects!! Great Ideas — 20 Winter DIY Projects! Thanks so much for hosting, Jen! And thanks for all the wonderful winter craft ideas. I found a ton of projects I want to get going on. Hope your weekend is going well. Enjoy your day! Thanks for the chance! I’d love the Silhouette ! So fun! Thanks for the chance! I’d be thrilled with the Silhouette! The Cameo would be totally awesome!!! Thanks for hosting! I took almost two full weeks off so I won’t be sharing but I love to check out all the links! I’ve been trying to win a silhouette forever! I would have asked for one for Christmas but no one in my family would know what I was talking about! Have a great weekend! I’ve had a little experience with a friend’s Cameo, so I would prefer that. I would give the Portrait to my little sis. Hope to win, have the perfect “crafty” friend to share with! Oh no! I accidentally linked my project to the wrong web link, and I can’t figure out how to delete it! So, I added it again, this time with the right link. (number 358) If anyone can tell my how to delete the one I messed up, I would really appreciate it! Love this linky party!! Have a great weekend! Did not get one for Christmas, but there is still hope. My 40th birthday is this month! I am just launching my new business and this would be SO AWESOME! Cameo would have been awesome! Thanks for continuing to host this year because I love this party. Also, thanks to all of you for sharing your creativity. I can’t wait to see the awesomeness you will share in 2014. I hope you each are having a Happy New Year! Hi Jen! Thanks so much for hosting. I am so happy to be back after taking several weeks off to migrate my blog from Blogger to WordPress. Happy new year! I was hoping for a Silhouette but Santa didn’t leave me one. Fingers crossed I win! Sharon @ Life After Empty Nest recently posted…Try Amazon Prime for FREE! Love the Cameo and this party! Thanks for hosting! You certainly had a fabulous 2013 Jen- I CAN”T WAIT to see what you do in 2014. So excited for you & all that is coming up.